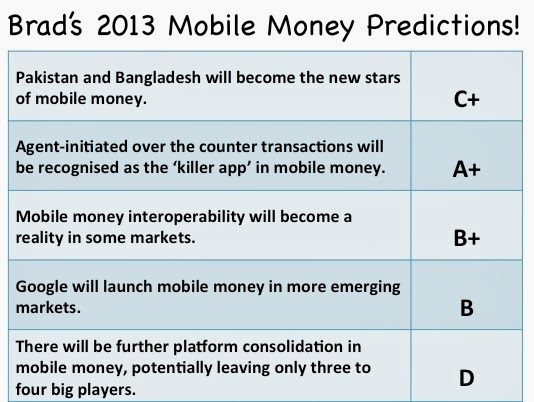 In January 2013 I wrote a blog with my five predictions for mobile money in 2013. I didn’t quite realize how momentous 2013 would also be for me personally, as I stepped out of the developing markets payments world in July last year to take up a new role transforming a developed markets bank in Asia. 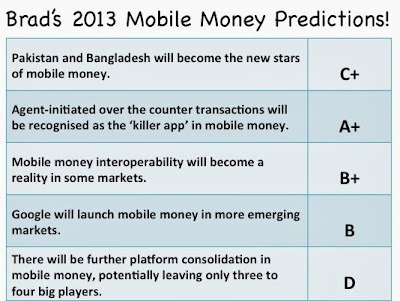 As a result, the time commitment of a new role has meant that this has been my first post on Mobile Money Asia for six months so I thought it would be a good opportunity to recap on 2013 and my bold predictions! So how close did I get? I think I was pretty spot on with a few of these and a little wide of the mark (or perhaps a little early) in some of the others. At the start of 2014 Kenya still leads the world in the penetration of mobile money. The most recent statistics indicated that mobile payment volume was close to US$20 billion in 2013, a 24% increase over 2012. Interestingly a lot of the growth is linked to increased integration to commercial banks, particularly with the introduction of lending products. Progress in Bangladesh and Pakistan is also very exciting however, with multiple banks and operators launching and scaling services. The digital money blog of Charmaine Oak’s ‘Shift Thought’ quoted that 17 banks in Bangladesh were now offering services, with over 7 million accounts, 100,000 plus agents, and payment volume of US$1.03 billion in the first quarter of 2013. This blog from CGAP echoes those figures, and also contrasts Pakistan’s volume, which is roughly the same. So on my first prediction that Pakistan and Bangladesh would become the new stars of mobile money, I would give myself a C+. Whilst there are some fantastic developments in both markets, Kenya is still moving ahead in leaps and bounds. Whilst the population in the two South Asian markets should eventually build to bigger volume, M-Pesa is still the poster child of mobile money at the start of 2014. Whilst missing the mark a little bit on my first prediction, I think I hit A+ for my prediction on OTC transactions being the killer app in mobile money. Despite Pakistan having stellar growth in mobile money volume, 83% of transactions are over the counter and nearly two thirds in Kenya are conducted the same way. Many customers are comfortable with the concept of agents completing transactions for them, and it is recognized that in markets like Pakistan and Bangladesh, shifting customers from OTC to mobile initiated transactions will take time. Just this week there was also a very interesting article in Bloomberg Business, which outlined, through the lens of Bitcoin and developing markets, how OTC is the primary method for conducting mobile money transactions in markets like Kenya, Bangladesh and Pakistan. Greg Chen of CGAP notes that illiteracy, a lack of technology proficiency and distribution remain the real barriers in branchless banking and moving beyond OTC payments. My third prediction was that we would see mobile money interoperability become a reality in some markets. Whilst we have not yet seen MasterCard and Visa achieve and enable the dizzy heights they predicted for mobile money interoperability a few years ago, Visa has certainly been putting its money where its mouth is. Visa announced its initiative in Rwanda in 2011 with a goal of providing banks and mobile operators with true mobile money interoperability. In addition to providing the technology to allow this to occur, Visa also developed rules and regulations to allow for disputes between parties and to build a mutually beneficial commercial ecosystem. 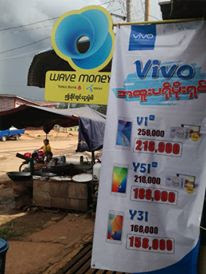 As of December 2013, Visa now has five banks signed up for its mVisa service, providing the mobile money world with a fascinating live test case on how interoperability can develop. In 2013 we also saw further developments in mobile money interoperability, with the announcement by Telkomsel, Indosat and XL the three major mobile operators in Indonesia, that they would provide real time money transfer between mobile wallets. With the developments of Visa in the market and a number of other initiatives, I would rate my prediction for interoperability as B+, as we have positive early signs of interconnectivity occurring, but we still don’t have sustainable commercial models of interoperability in mobile money. My fourth prediction was that the industry would see a lot more from Google in developing markets, particularly continuing the development of their BebaPay prepaid transit card product in Kenya. The development of BebaPay appears to be slow in Kenya, as resistance to the product from bus conductors and drivers as well as technology barriers impact acceptance. From discussions I had last year with Google insiders, the next markets to be tapped included the Philippines and Indonesia. I had heard that Indonesia was proving to be difficult due to payments regulation so it is not surprising that Google launched in Manila in September 2013. The launch, partnering with major local bank BPI, has focused initially on universities in order for students to have a prepaid card for general use. Merchants are predominantly food and beverage at this stage, although Google have ambitions of moving into transit as they have done in Kenya. So I am scoring myself a B for the development of Google in emerging markets in 2013. Whilst development hasn’t been as fast as I would have expected, Google are on the move with a prepaid card product for developing market customers in Asia. My last prediction for 2013 was that we would see further consolidation of platform vendors, leaving only three to four in the market. This has probably been my lowest performing prediction, and in addition I would guess that this year has not been a great year for those selling mobile money platforms. Most clients who already need a platform have one, and those that have already invested are more interested in trying to make money out of the service rather than buying new technology. To get a sense of how the vendor industry is looking for mobile money currently, I used a highly unscientific method of assessment! I googled each of the major vendors to get a sense of how many press releases they had released recently. The statistics were interesting. Fundamo/Visa had press releases in recent months announcing developments in ATM cards linked to mobile money in Pakistan and a new client in the same market. Mastercard had announced a tie up with eServ Global and BICS to establish a mobile money international remittance hub. The latest news on new client acquisition for Telepin was January 2013, and for Utiba it was October 2012! So in summary, I would give myself a D for that prediction, with the qualification that it appears that there has been very little vendor success in general in 2013, which may lead to consolidation in 2014 and beyond as smaller companies struggle to survive in a maturing market. In closing then my consolidated scorecard for 2013 doesn’t look too bad. I would be very interested in views from the industry on what I am right or wrong on? Brad, I think you're being too harsh on yourself. The volume in the market in Bangladesh should be enough to boost your score on that prediction, even though Kenya is surging ahead. What you missed about Kenya is that the widespread penetration is finally starting to get used for some new services beyond remittance, and Safaricom's more recent pushing of its billpay services. I can only hope this trend gets mirrored in other markets, as this is where the mutiplier effect of access to the financial system can really start to come into play. The analysis of vendor announcements is sobering, I think it demonstrates that there is a sense of the honeymoon ending and a lot of people realising how difficult this work is. Hi Brad. So what have you been doing the last six months? Just curious. I share Michael's view that you were harsh with yourself on the first one, but frankly a little generous on the third. Good intentions have always been there, actual traction is quite another matter. On the other hand, I am totally confused with the second one. How is OTC a "killer app?" I see it as a process to have your stuff done (by handing the cash over to the agent and having him/her press buttons on their phone, rather than you pressing buttons on your own phone and having the money flow through your account), not an "app" in itself. Also, in what sense are two-thirds of Kenyan transactions OTC? M-PESA agents cannot pay bills or process a P2P transfer for you, you've got to do it from your own phone + account. If by that you mean that most transactions start in cash and end in cash, I fully agree, but that's hardly a 2013 phenomenon so there would be no excuse for not getting that A+ you gave yourself. It seems to me that you are stretching the definition of OTC to mean "pure payments and little/no electronic savings" -- hardy a matter of agent counters. Anyway, thanks for sharing your views on last year, that was very interesting. Any bold predictions for the next one?